Newton straddled the shortest overland communication between Manhattan and the Great Lakes. A continuous line of stages commenced running over this route from Geneva to Jersey City in July 1825, covering 250 miles and some very hilly country in only three days. As early as 1836, Major Ephraim Beach surveyed a portion of this route for a railroad from Stanhope to Newton, fourteen miles in length, with grades of one hundred feet per mile. It was intended that this line be extended through Culvers Gap to the Delaware River, connecting with other projected railroads tapping into the Pennsylvania coal fields. The plan never advanced beyond the original survey due to a lack of capital and competition from other rail projects, particularly the Erie Railroad. still, the Beach survey is fundamental to the railroad history of Sussex County. The Sussex Railroad pretty much followed the route surveyed in 1836, though it never reached beyond Branchville in its attempt to cross Culver's Gap into the upper Delaware Valley. At the request of the Directors of the Morris & Essex Railroad Company and a committee of the inhabitants of Sussex County, Ephraim Beach spent May 11, 12, and 13, 1836, exploring alternate routes for an extension of the Morris & Essex Railroad to Carpenters Point in the upper Delaware valley. He summarized his findings in a letter to Samuel Price of Branchville, New Jersey, addressed from his residence in Catskill, New York, on May 20th, 1836. Therein he stated that he had examined the countryside preparatory to commencing an actual survey about the first of June 1836. The proposed railway was to pass up the North Branch of the Paulinskill through the Gap of the Blue Mountain, called Culvers Gap, approaching the Delaware River, a short distance above Milford, and along the same to Carpenters Point. He probably followed the turnpike, traveling northward from Culvers Gap, but on his return southward, he explored a more northerly route ... leaving the Delaware at Carpenters Point, ascending the slopes bounding the valleys of the Little and Big Flat Brooks, to Culvers Gap... Beach concluded that: From Carpenters Point, ascending to the summit of the Blue Ridge in Culvers Gap, there are no difficulties to be encountered, and I am confident that on that section no grade need be adopted exceeding forty feet per mile ascent, and if desirable may be reduced below that. A somewhat steeper grade must be adopted between the summit of the Blue Ridge at Culvers Gap down to Branchville. From Branchville, the railroad would descend through Lafayette to Newton. Local hopes for a railroad were stimulated by a sudden awakening of Sussex Countys mineral potential. Peter Cooper, Edward Cooper and Abram Hewitt, proprietors of the Trenton Iron Company, re-opened the abandoned Andover Mine in July 1847. A steady stream of heavy wagons, employing no less than 152 to 200 teams, of two and four horses each, freighted ore to Waterloo for transshipment on the Morris Canal to the Thomas Iron Furnaces in Allentown, Pennsylvania. The Trenton Iron Company reportedly paid $800 in turnpike tolls in 1848. The Sussex Mine Railroad was chartered on March 9, 1848, for the sole purpose of transporting iron ore between Andover and Waterloo. The incorporators were Peter Cooper, Abram S. Hewitt, Edward Cooper, David Ryerson, Nathan Smith, Andrew A. Smalley, John Willis and Alexander McKain. To forestall such a competitor and prevent the loss of tolls, the Morris Turnpike applied in November 1849 for a charter supplement to allow laying a plank road over its existing right-of-way between Newton and Dover. Mine owners Peter Cooper and Abram S. Hewitt built the Sussex Mine Railroad as a mule tramway in 1851 for small ore cars, called Jimmies, each with a capacity of six to eight tons. Three or four mules dragged each ore car to the White Hall Summit, whence two mules were sufficient to convey it downgrade to the canal bank at Waterloo. Two or three hundred tons were transported daily, a round trip taking about five hours. In 1851, Thomas Nestor, of Andover, drove an ore car to Waterloo containing a five-ton specimen from the Andover mine for shipment to the London Exposition, where it won the first premium in a world-wide competition. The Morris & Essex Railroad reached Dover in July 1848, making this village the focus of important lines of travel and commerce. Freight agents in Newton brought the country trade in butter, pork, poultry, and farm produce to the depot. By July 1851, the Morris & Essex was running one freight and four passenger trains daily between Dover and Newark. The Board of Directors decided to extend their line to Stanhope and Hackettstown, a distance of 18 miles, at an estimated cost of $400,000 (or a little over $22,200 per mile). On February 10, 1852, Jedediah B. Bassinger, Chief Engineer of the Morris & Essex, advertised for contractors to build their Hackettstown extension, stock to the amount of $300,000 having been subscribed for that purpose. Contracts were awarded in May 1852. At this time, the proprietors of the Sussex Mine Railroad undertook a survey for an extension of their line from Andover to Newton and its conversion to steam locomotion. Hoping to accrue a large accession of business from the speedy construction of the Sussex Railroad, the Morris & Essex Directors offered very generous terms: the Sussex Railroad would receive a drawback of 33-1/3% on all traffic delivered at Waterloo for transport over its line, if it were ready for use on the day the Morris & Essex reached the point of intersection. Abram S. Hewitt announced this highly favorable arrangement and outlined surveys of the various routes for the extension of rail service to Newton in August 1852. According to his statement, Adolphes Savery, the Chief Engineer of the Sussex Railroad Company, determined that the shortest and most practicable route would connect with the Morris & Essex Railroad near Morris Canal Plane No. 4 West at Waterloo, 10-3/4 miles from the terminus at Newton. It was found impossible to reduce the grade below seventy-five feet per mile in passing the summit of Sparta Mountain at Whitehall without incurring great expense. The excavation and embankment at that point would exceed 200,000 cubic yards. From Andover to Newton the grades would not exceed seventy-five feet per mile. About one half of the projected route ran in a straight line and a large proportion of the remainder involved curves exceeding 3,000 feet in radius. In only one place was it necessary to adopt a curve of less than 1,500 feet in radius. The rails were to be made of the best Trenton iron, weighing 50 lbs. per yard. The estimated cost to build and equip the road was $300,000. To raise this sum, the Company proposed to issue $150,000 of stock and $150,000 of mortgage bonds. To secure their railroad, the citizens of Sussex County were required to subscribe for $100,000 in First Mortgage Bonds, bearing 6% interest. These were convertable into stock at any time within five years and payable in stock at any time after five years. The Company also expected to secure the right of way from Andover to Newton free of charge. Public meetings were held and 92 citizens subscribed $100,000. In April 1853, Messrs. Phelps & Company, of Massachusetts, took the contract for grading the route and building the superstructure of the Sussex Railroad. Completion of the whole work was expected by the following December. The editor of the New Jersey Herald argued for a six-foot guage to accommodate passage of rail cars from Western lines. Ground was broken on May 5, 1853, and the contractors, Messrs. Phelps & Co., immediately employed 700 men to excavate and grade the route between Newton and Waterloo. Two or three shanties were built for the accommodation of their employees. The heaviest work was undertaken in the vicinity of the Iron Hotel at the White Hall Summit, where a cut of 45 feet was required. A sink hole just beyond it required considerable fill. The slate cut two miles south of Newton also slowed the work. The old mule road being indispensible to the transport of ore for the Trenton Iron Company, an entirely new railroad bed had to be built for most of the way. In June 1853, the grading progressed rapidly, despite difficulty in employing help. Arrangements were made to increase the work force and, more particularly, the number of horses and carts needed to remove gravel and sand where the cuts were made. Workmen cut blue limestone from Halsted Townsends quarries below Newton for building bridges and culverts. With their deadline in mind, Cooper & Hewitt pushed construction forward as rapidly as possible while agents of the Morris & Essex threw every obstacle in their path to prevent the agreement from taking effect. It was soon learned that contractors working in the deep cut near White Hall were being liberally compensated for delaying progress. Work at the Andover mine was temporarily suspended and nearly 400 miners were put to work on that section of the railroad. To make up for lost time, the cut was materially raised, making this portion of the road the steepest along the line, rising no less than 165 feet to the mile. With considerable effort, the road was completed in time and the agreement held in full force. The first locomotive entered Newton on November 27, 1854. The extension of the Morris & Essex Railroad to Hackettstown opened in January 1855.
depot at half past twelve, moving eastward towards Drakes Pond and the Slate Cut. The inhabitants of Andover were on hand to honor the occasion, crowding windows and stoops. The train stopped briefly to take on a few passengers and steamed on to Waterloo, arriving five minutes before the train arrived from Hackettstown on the Morris & Essex Railroad. Mr. Bartow, proprietor of the Waterloo Hotel, served dinner for the excited travelers. A large frame Depot was built at the foot of Spring Street in May 1855. Trains pulled into this immense barnlike structure far enough that the engine with its smokestack projected beyond the wide opening at the far end facing Spring Street, thus allowing smoke and cinders to escape into the open air without choking passengers and crew inside the station (The 1855 Depot is shown in the 1883 Panorama above. Note that the corner of the building was clipped in 1873 to allow the passage of Sparta Avenue. The round table is directly behind the Depot and the Engine House stands to the right. The Depot and round table are shown in the 1856 Hughes' Map of Newton to the right). The Sussex Railroad commenced operations running two trains daily from Newton. The first two locomotives were named the Governor Haines and David Ryerson to honor two prominent sons of Old Sussex. Later came the engine known as the Abram S. Hewitt. Samuel Springsteen was the first engineer to run a regular train on the line and he, like the first engines, came from the Erie Railroad. George Everitt, of Andover, was another early engineer. James Demarest, a friend of the Hewitts from New York City, became the first conductor, settling at Newton. Peter Cannon, another Hewitt protege, also came from New York City to Andover, and later to Newton, where he acted as station agent and general superintendent for many years. Joseph Quackenbush, better known as Uncle Joe, settled at Andover in 1853 and first served as switchman, then fireman. On December 1, 1855, Capt. Joseph Quackenbush was appointed Engineer on the Sussex Railroad in place of Capt. Charles Henderson. His foot was horribly mangled in an accident at Waterloo in 1860, but he survived to retire in 1890, living out his days in Newton. Before the advent of steam communication, the frozen mud roads were lined with covered wagons carrying country produce to city markets --- the Big Trip in November took three to five days. Four inns once lined the road between Newton and Stanhope, but many wayside taverns disappeared along with such old-time caravans of market wagons. Newton, the terminus of the Sussex Railroad, grew steadily under its influence. Farmers now conveyed large quantities of pork, grain, butter, beef and flour to the depots at Newton and Andover. The old county town consequently experienced rapid commercial and residential expansion. Commanding the trade of the surrounding valley, the town square filled with brick row storehouses. Overcoming the lack of a natural water power, rail-transported coal fueled Newtons industrial development. In June 1854, John W. Lane and Samuel H. Bodine installed the Countys first steam engine in the Sussex Foundry at 189 Spring Street. In December 1854, Edward C. Moore became the towns first coal dealer. Moses W. & Henry C. Northrup opened the Newton Steam Gristmill in November 1855, producing premium grades of flour. George H. Nelden & Samuel Bodine opened the New Jersey Foundry at the corner of (123) Spring and Moran Streets in August 1859. The opening of railroad facilities at Newton fed the demand for residential properties and several new streets opened. Robert Hamilton, John Townsend and John McCarter, Jr. offered building lots on Broad Street for sale in September 1854. In honor of these three landowners and promoters, Broad Street soon became known as Trinity Street. Moran Street was extended across their lands toward the meadows and Hamilton Street was also surveyed. The first houses on Union Place were built in 1855 upon lands belonging to Theodore F. Anderson. Uptown, John Linn opened Linwood Avenue and surveyed his property into building lots. Martin Ryerson laid out Halsted Street as a new thoroughfare leading from Main Street to the Railroad Depot in the fall of 1857. By the time the new street was ready for public use, plans for six houses had been drawn. By January 1858, the Sussex Register reported that twenty new buildings were under construction in Newton and that the number of buildings in town had doubled since the opening of rail communication five years earlier. 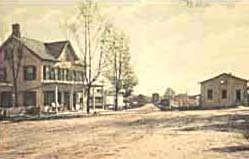 On January 21, 1859, with ten large buildings under contract in Newton, the Register's editor remarked that many years would elapse before our town will be finished and ready to be fenced in. Halsted Street was pretty well built up by May 1859 and Martin Ryerson awarded Robert Space the contract in November 1859 to grade Madison Street from George L. Smiths residence (now 36 Madison Street) to the Springdale Road. The population of the village rose from 855 in 1850 to 1,824 in 1860, at which time Newton boasted 308 dwellings occupied by 359 families. On January 12, 1858, stockholders of the Sussex Railroad met at the Newton Depot to elect nine directors in place of the incumbent Board of Directors whose resignations became effective on that date. David Ryerson, John Rutherfurd, John A. Horton, Martin Ryerson, Edward C. Moore, Thomas Hewitt, Aaron Peck, Thomas N. McCarter and John Linn were chosen. The new board met at the Cochran House on January 16, 1858. New stock was exchanged and bonds transferred. Advertisements list David Thompson as treasurer and George H. Nelden as secretary. One of first actions of the re-organized company was to announce that two daily milk trains would run on the Sussex Railroad, beginning about April 1, 1858, in connection with the schedule of the Morris & Essex Railroad. At the annual election for directors, held at Newton on May 5, 1858, John A. Horton, Aaron Peck, John Rutherfurd, John Linn, Thomas N. McCarter, Edward C. Moore, Thomas Hewitt, Samuel T. Smith and David Ryerson were chosen. The Board of Directors then elected John A. Horton, President, and George H. Nelden, Secretary. John A. Horton, president of the Sussex Railroad, died November 15, 1858, aged 51 years (See the history of the Horton Mansion). The Directors of the Sussex Railroad met on December 2, 1858, to elect Martin Ryerson to the board and Aaron Peck to succeed John Horton, deceased, as president. In March 1859, the President and Directors of the Sussex Railroad announced their intention to run a morning and afternoon train on the Morris & Essex, as soon as arrangements could be made. Company president Aaron Peck personally supervised repairs to the road. Danforth & Cookes representative visited Newton on June 21, 1859, and contracted with the Sussex Railroad for a new engine of equal value and power as the Abram S. Hewitt. The engine, named the Aaron Peck, was delivered on November 23, 1859. Considerable economic progress was evident on the home front during the long years of Civil War. The hotel business thrived as Newton became the county recruitment center, filled with volunteers, draftees, their wives, mothers and sweethearts. Trains carried the troops to their training grounds and the front. The Sussex Railroad completed improvements to its track, provided new livestock sheds and built a new Engine House in July 1862. Sussex pork commanded premium prices and there was a great rush of freight over the line, with 290,00 lbs. of dressed hogs, and a correspondingly large supply of poultry, being shipped during the first weeks of November. On November 21, 1862, Peter Cannon succeeded John Schuyler as freight agent and Captain Peck was again appointed Superintendent in place of John Schuyler, resigned. The battle between the ironclad gunboats, the Monitor and the Merrimac, at Hampton Roads in March 1862 generated considerable excitement around the world and predicated a complete revolution in the construction of naval vessels .... The War Department of Great Britain experimented upon two ironclad targets  one of the same thickness as the American Monitor and the other built to the specifications of the British man-of-war Warrior  proving that either could be riddled at a distance of 200 yards. A single bar of Franklinite, tested by order of the French government at the National Forges of the Cussade, proved that its tenacity exceeded that of the best irons of England, Spain, Sweden or Siberia, all of which were tested at the same forges. The New Jersey Herald urged the Federal government to experiment with Franklinite as the best article for use in iron cladding its ships, for manufacturing cast and wrought iron for large caliber guns and for covering forts. Returning to Franklin in 1921, after an absence of thirty years, Joseph Richards recalled the days when his father was foreman at the Lang Shaft of the old Franklin Iron Company under the superintendency of Richard Stephens. That was back in 1864, when the mining town had a population of about 500 people and no railroads. The Richards family came as far as Warwick, New York, by rail and then by stage coach into Franklin. At that time, ore was hauled in wagons, pulled by six or eight head of horses, out of Franklin to woodport on Lake Hopatcong, and then shipped by boat down the lake via the Morris Canal to Newark. It took teamsters a day to make the round trip. They were skilled drivers with long snake-like whips to nip the hide of any horse or mule. The Ogden Mine Railroad Company was incorporated in 1863 to carry ore from Richard R. Morriss mine atop Sparta Mountain to Nolans Point on Lake Hopatcong, from whence it would be carried by canal to the Musconetcong Iron Works at Stanhope. Mules also carted bulk ore from Franklin and separated zinc ore from Sterling Hill in Ogdensburg up the mountain, using stone steps or terraces, for transshipment over the Ogden Mine Railroad. Morris Canal boats carried the Passaic Companys ore from Nolans Point to Jersey City where it was finally processed into white oxide of zinc and sold to paint manufacturers. But with the Civil War pressing all means and routes of transportation to their limits, the Sussex Railroad contracted with Mr. Noble, proprietor of the Mercer County Zinc Works, in January 1864 to forward 60 tons of zinc ore brought weekly by wagon from Franklin to Newton to their Trenton mills. This amount was usually sent down by canal in summer and by rail in winter. Industrialists Moses Taylor, John I. Blair, Seldon T. Scranton, Joseph H. Scranton, Charles Scranton, and William E. Dodge, proprietors of the Lackawanna Iron and Coal Company, of Pennsylvania, purchased the Boston Franklinite Companys mineral properties and ironworks in May 1864. To develop their mineral holdings, they also purchased control of the Sussex Railroad from Captain Aaron Peck in 1864, effectively subordinating the Sussex Railroad to the interests of the Delaware, Lackawanna & Western. The stock soared to four times its value and Aaron Peck realized $60,000 by the advance. The companys annual election on May 25, 1864, produced a new Board of Directors, consisting of: Aaron Peck, John Rutherfurd, John Linn, Martin Ryerson, Moses Taylor, John I. Blair, Selden T. Scranton, Joseph H. Scranton, Charles Scranton, Samuel Marsh, and William E. Dodge. Aaron Peck was re-elected president, David Thompson, treasurer; and George H. Nelden, secretary. On June 16, 1864, the new owners met in Newton and then made a tour of observation to Franklin and Warwick. Aaron Peck, president of the Sussex Railroad, died at East Orange on April 8, 1865, aged 67 years. John I. Blair was elected company president to replace him. In September 1866, a new broad-gauge engine, called the John I. Blair, was added to the rolling stock and plans were made to change the gauge to correspond with that of the Morris & Essex. Contractor William H. Bell, of Branchville, began work on an extension of the Sussex Railroad through Lafayette to Branchville in 1867. The work was undertaken to provide an outlet for the agricultural products of that portion of Sussex County, lying along the base of the Blue Mountains, and with the further intention of extending the line to the Delaware River via Culvers Gap. The extension was funded by an offering of $180,000 in new stock, but the work proceeded very slowly. The management of the Sussex Railroad held several meetings in December 1867 to secure the right-of-way for an extension of their line to Franklin. Conferences were held with property owners along the proposed route; a few offered to donate the right while many held to high prices. The original plan to reach Franklin called for a departure from the main line at a point near Andover, following the chain of ponds up to Woodruffs Gap and from thence to Ogdensburg and Franklin. However, it was clearly to Newtons interest and advantage that any extension of the Sussex Railroad be built from the Newton Depot, so as not to by-pass the town, especially if it was to form a link in one of the great interior lines of transportation connecting the New England States with the South and West. A Citizens Committee from Newton met with the joint-owners of the Franklin mines and the Sussex Railroad in January 1868, to discuss the proposed branch railroad to Franklin. The Sussex Railroad Company offered to build the main line through Newton, if its citizens agreed to raise $10,000 to secure the right-of-way from their village to a point in the line of the Branchville extension, about a mile and a quarter from the Newton Depot.They were also to secure the right-of-way from the Warbasse Farm to Franklin, by one of three routes to be selected by the Company, for an amount not to exceed $15,000. The Citizens' Committee had accepted the proposition and now depended upon their fellow citizens to ratify their action. Judge Martin Ryerson spoke in its favor and Jacob Swayze moved its acceptance. The necessary bonds were accordingly prepared and signed by nearly all in attendance. Thirty of the towns most prominent citizens signed a $25,000 bond while the remainder subscribed to an indemnifying bond. The $25,000 bond was presented to the owners of the Sussex Railroad in New York on January 17, 1868, with a provision that the Company run all passenger trains through Newton. Four routes were considered for extending the line from the Paulinskill on the Warbasse Farm; the westward route proved the most direct and used a mile more of the Branchville line than the others under consideration, though heavy rock cuttings would be required. This route departed the Warbasse Farm on the East Branch of the Paulinskill and proceeded on a level along several successive limestone ridges, running through Lafayette and thence westward of Monroe Corners. Two other projected routes also utilized the valley of the East Branch of the Paulinskill, while the most easterly route passed a mile and a half north of Sparta, through Ogdensburg and on to Franklin. Having adopted the Lafayette route, the Directors of the Sussex Railroad authorized the trunk line to Franklin Furnace at a meeting in Newton on May 1, 1868, and Chief Engineer Charles E. Noble let contracts to grade the nine miles of proposed track. Although its road bed required an additional expenditure of $14,000 to prepare it for the superstructure, the Directors also agreed to purchase William Bells entire stock and interest in the Branchville extension. The five miles of road bed running along the bog meadows was as dry and firm as any other section, having settled very little, even in the wettest places, since its construction. Preparations to extend the Sussex Railroad beyond Franklin, to Hamburg, were also made in November 1868. With the imminent arrival of the Sussex Railroad at Franklin, plans were made to erect two iron furnaces and a zinc works at that place. John Blair spent several days at Franklin in the first week of May 1868, completing arrangements and awarding contracts. Grading began on the three-mile line between the village and Warbasse Junction in May 1868 and was pushed rapidly forward. Once the rainy season ended in June 1868, a large force of workmen worked with all appropriate speed. After delays occasioned by a nationwide shortage of railroad iron, a shipment of rails finally arrived in the Newton Depot in September 1868 for use on the extensions to Branchville and Franklin. The grading completed, the contract for laying the iron rails was awarded in November 1868 to Isaac L. Overton, the contractor and builder of the Episcopal Church in Newton. Contracts for grading a further extension of the line from Franklin to the State line were awarded in December 1868. Looking after its own sphere of interest and profitability, the Morris & Essex Railroad Company vigorously opposed the Sussex Railroad's application for a supplemental grant of authority. Theodore Randolph, president of the Morris & Essex, was also the Democratic candidate for Governor. He decided to oppose the any further extension of the Sussex Railroad unless the 1853 contract (providing for a 30% drawback on freight brought to the M & E on the Sussex Railroad) was abrogated. His Republican opponent was none other than John I. Blair. president of the Sussex Railroad. In response to Randolphs threats, William E. Dodge publicly announced that there would be no further extension beyond Branchville and Franklin, if the contract was not maintained. He also stated his determination to apply again for authority to go to the Delaware River, and also to Deckertown, and to build spurs to different mines in Sussex County. 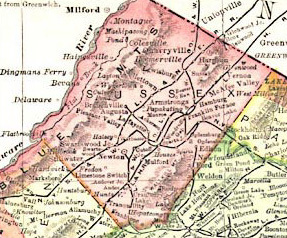 Furthermore, without a supplement allowing an extension of the Sussex Railroad to the Delaware Water Gap, there would be no extension to the State line in Vernon. One of the objects of the plan was to make it part of a great coal line from the Scranton coal mines to Newburg and New England, and of a through line from New England to the South and West. Unless this linkage was made, then an extension to Vernon would not pay for itself. The case of the Morris & Essex Railroad versus the Sussex Railroad reached the Court of Errors and Appeals at Trenton on November 19, 1868. Jacob Vanatta, of Morristown, made the arguments on behalf of the Morris & Essex and Thomas N. McCarter, of Newark, on behalf of the defendants. The main question involved the validity of a contract entered into at the time of the construction of the Sussex Railroad, whereby the Morris & Essex granted a large drawback of 25% for passengers and 30% of all freights which passed over at least two miles of the Sussex Railroad, and afterward over the Morris & Essex Railroad. At the time (1853) that the contract was made, the Sussex Railroad had charters for extension of their road to Phillipsburg and some other point, but these extensions had not yet been built or commenced. Subsequently, however, the road was extended and the Morris & Essex Company refused any longer to pay the liberal drawbacks on the ground that they were not bound by the terms of the contract to pay it on those extensions which might be built. While the Court of Chancery upheld the claim of the Sussex Railroad, this ruling was reversed by Justice Bedle in the Court of Errors and Appeals by a vote of 7 to 2. Contractor William H. Bell only began laying track on the Branchville extension in November and December 1868 and made steady progress despite inhospitable weather. The first train on the Branchville branch of the Sussex Railroad passed over the road from Lafayette to Newton on New Years Day 1869, when about 100 citizens braved a driving snow storm and heavy snow drifts to make the inaugural excursion. They were served a bounteous dinner at the Anderson Hotel in Newton. Those interested in completing the Branchville extension spent February 6, 1869, hauling iron to the line of the railroad. At that time, the iron was laid to one and a half miles beyond Lafayette. The track was laid nearly to the terminus in April 1869, but the road had not yet been ballasted beyond Warbasse Junction. Arrangements were made with the new management of the Morris and Essex Railroad to run a regular milk train on their line, connecting with one running daily from Branchville. The Lackawanna Iron Company purchased 32 acres of the Fowler property at Franklin, near the terminus of the Franklin railroad extension, in February 1869. The rails reached within a mile of Franklin in April 1869, when the extension was described as a well laid and well ballasted road, having a firm and solid bed, and being built of iron and ties of the best material. The Sussex Railroad placed the new locomotive, the Franklin, manufactured by the danforth works of Paterson, on its line in May 1869. Daily trains began running over the Franklin branch of the Sussex Railroad, to within half a mile of Franklin, on July 16, 1869. By this time, the line was completed to the Fowler Mansion, near the Wallkill, over which a stone bridge costing $5,000 was being constructed. The railroad was to be further extended to Hamburg and Vernon, with the ultimate hope of a connection with the Warwick Valley Railroad, a branch of the Erie. A spur from Hamburg, running about two and a half miles northeast to the Pochuck hematite mine, was graded in December 1868. The Branchville extension opened for business on Saturday, July 4, 1869. It intersected the main line near Drakes Pond, nearly a mile distant from the terminus, thus placing Newton at the end of a spur. The new line of track passed through Lafayette and Augusta. The Morris & Essex Railroad, with all its franchises and property, was perpetually leased to the Delaware, Lackawanna & Western Railroad Company in late November 1868. The D. L. & W. agreed to complete the Boonton Branch at an early date, to make other improvements, and to pay the M. & E. stockholders 7% in semi-annual dividends for five years and 8% thereafter, so long as the net earnings amounted to a certain specified sum. The transfer was to take place on January 1, 1869. The Legislature ratified the lease in February 1869. The new managers determined to finish the double-tracking without delay, and to construct such other tracks and additional facilities as were necessary to accommodate the increasing coal and freight business. For these ends, the Morris & Essex had executed $3,000,000 in bonds convertible into their stock, and drawing interest at 7%, payable semi-annually, in January and July. These bonds were were offered at 85% of their value to the stockholders of the Delaware, Lackawanna & Western Railroad Company pro rata, according to their respective shares of stock. Once these bonds were taken, the work was to commence without delay. The Morris & Essex also entered into negotiations with authorities of the Midland Railroad with a view to consolidating their interests in the construction of a rail line from Paterson to New York. In a grand scheme of consolidation, the Delaware, Lackawanna & Western Railroad Company secured a controlling interest in the Syracuse & Binghampton Railroad in New York, with the intention of building fourteen miles of new track from Great Bend to Binghampton, thereby creating a continuous line from Oswego to Hoboken on the Hudson River. This route incorporated 84 miles of the Morris & Essex Railroad, 127 miles of their own railroad, 81 miles of the Syracuse & Binghampton Railroad, and 36 miles of the Oswego & Syracuse Railroad, for a total of 328 miles. In May 1870, representatives of large majorities of shareholders of the NJ Hudson & Delaware, the NJ Western, and Sussex Valley Railroad Companies ratified a consolidation into the New Jersey Midland Railway Company at a meeting held in Taylor's Hotel, Jersey City. With the advent of rail communications, the New Jersey Zinc and Mining Company, of Newark, shifted their operations from Sterling Hill to Franklin Furnace in September 1869. By November 1869, a hundred tons of magnetic ore from the Franklin mines passed daily on the Sussex Railroad en route to Scranton, Pennsylvania. In November 1869, contractors Smith, Towell and Irwin pushed the Franklin extension to completion. Nothing further remained to be done, except to build a bridge of one span across the Wallkill, to fill a portion of the heavy embankment and to lay the track. The Sussex Railroad Company erected a temporary engine house, near Franklin, to accommodate their engines during the winter. The new main line of the Sussex Railroad was constructed across the bog meadow, northeast of Newton Depot. Contractor O. N. Saulsbury commenced work on November 16, 1871, with a force of thirty men. The ground here was so swampy that the track was laid upon layers of wooden planks: the first layer of planks was laid crosswise, a second layer was laid diagonally, whereupon the ties were then fixed and the intervening space filled with gravel. The new track across the meadows between Newton and Lafayette was completed by placement of a switch on June 7, 1872. For nearly a decade, a section of track beyond the Big Spring repeatedly disappeared into a sink hole, disrupting traffic and requiring considerable fill to stabilize the road bed. When the Midland Railroad connected with the Sussex Railroad at Franklin in June 1872, Moses Taylor, William E. Dodge, John I. Blair, Seldon T. Scranton, John H. Brown, E. T. Hatfield, Jr., and Joseph C. Platt, Jr., organized the Franklin Iron Company, with mineral rights to 12,000 acres in Sussex County, including one mountain tract of 7,000 acres. Ore came from mines at Franklin, Canistear, and Pochuck Mountain. A new furnace was erected at Franklin during the following year at a cost of $500,000, producing pig iron which was transferred to Scranton, Pennsylvania, for conversion to Bessemer steel. The crucible was 67 feet high, 23 feet in the bosh, and 10 feet in the hearth. It was surrounded by three brick buildings: an engine house, a stock house, and casting house. Running at full capacity, Franklin Furnace produced between 250 and 300 tons of pig iron weekly. The Sussex Railroad Company contracted with the Franklin Iron Company to transport 17,000 tons of ore from the Franklin and Pochuck mines during the summer months, and with the Passaic Zinc Company to transport 25,000 tons of zinc ore. The railroad also carted Spanish ore to Franklin, where it was mixed with local ores to produce a superior quality of Bessemer iron. The Franklin Iron Company purchased a mineral tract along the Hudson River in New York, and was to receive ore from these mines, as well as African ore, all of which was to be shipped from Hoboken over the D. L. & W. and Sussex Railroads. They received large shipments of coke from Connersville, Pennsylvania, using one-fourth coke with three-fourths anthracite for their fuel. About 75 men were employed at the works. Acquiring trackage rights over the Midland Railroad between Franklin Depot and Hamburg, the Sussex Railroad Company built a railroad spur, several miles in length, in 1870-71, running via Hamburg to the foot of the Pochuck range, where a valuable iron mine was located. The mine owners went to great expense to tunnel the hill and erect a stationary engine to bring the ore down. The McAfee extension opened September 1, 1871. This branch was sold to the Lehigh & Hudson Railway in 1881. The Sussex Railroad further envisioned an extension beyond the Pochuck Mine in McAfee to complete a connection with the Warwick Valley Railroad  a linkage which the Lehigh & Hudson River Railway accomplished in 1882. It apparently sought a branch railroad to the Delaware River and a connection with the enormous coal trade eminating from Pennsylvania. It also intended to build spurs to mines in Sparta, Hardyston and Vernon. Samuel Sloan, President of the Delaware, Lackawanna & Western Railroad, in company with John I. Blair, William E. Dodge, Moses Taylor, William Walter Phelps and Seldon Scranton, all prominent railroad men, accompanied a number of local stockholders of the Sussex Railroad on an excursion to Franklin on July 23, 1872. Onlookers could only guess at the object of their visit, but it was generally supposed that the transfer of the Sussex Railroad to the D. L. & W. would result from the conference. 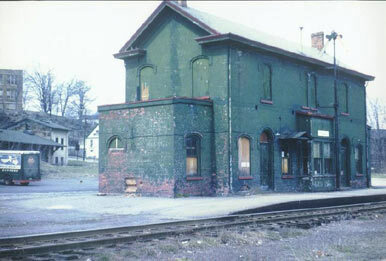 A comfortable Passenger Station was built of pressed brick at Newton in August 1872. Double doors separated the two waiting rooms on the first floor and the ticket office occupied an octagonal apartment. The Companys offices were located on the second floor. A broad platform covered by a portico surrounded the entire building. The repair shops were to be relocated here from Waterloo because the mechanics lived in Newton and would no longer require transportation to and from the shops. Consequently a new Engine House and Machine Shop, 110 feet long and 36 feet wide, capable of housing four locomotives, was built facing the turntable. In October 1872 the company excavated a reservoir to store water in the rocks of Halsted Heights, above the site of their new facilities. The new Franklin Furnace was put in blast on February 3, 1874, but operations were suspended after only five months on account of the depressed condition of the iron business. Within a short span of months, factories stopped, laborers went tramping about begging for bread, land depreciated in value from 30 to 50 per cent and was fast being sold under the Sheriffs hammer. While former panics came and went within a few months, these hard times lengthened into the Long Depression. In March 1874, the Midland Railroad fell into receivership having failed to meet its running expenses. In March 1875, trustees appointed by the Committee of the New York and Oswego Midland Railroad Board prepared an elaborate plan of re-organization. The road was to be purchased by the trustees under foreclosure, and they would then organize the New York Midland Railroad Company. Consequently, by April 1875, the Receiver of the Midland Railroad was replacing old rails along its entire route. On November 14, 1879, Kennedy G. White, of New York, purchased the New York Midland, consisting of 250 miles of track on the main line between Middletown and Oswego and 95 miles of branch lines, at public sale for $4,600,000. In 1882, an extension of the Midland Railroad was built to Stroudsburg, Pennsylvania, and the old company became the New York, Susquehanna & Western Railroad. A mile and a half of new steel rails were laid along the Sussex Railroad, near the Cranberry Lake Reservoir, in December 1876, making this section a great improvement over the balance of the line. The company received new steel rails sufficient to complete half of the distance between Newton and Waterloo. Five car loads of steel rails arrived in January 1877 and trackmen began laying the new track between Franklin and Sparta Station. As mining and manufacturing interests began to revive in the summer of 1879, over fifty furnaces that had been out of blast for a long time returned to work in May 1879. Franklin Furnace was put in blast on July 5, 1879, after five years suspension. By the end of the month, it was producing 350 tons weekly. By October 1879, the daily wage of miners at Franklin and Ogdensburg and of laborers at the Windsor Lime Quarries in Hamburg increased from $1.00 to $1.25. The Sussex Railroad Company contracted with the Franklin Iron Company to transport 17,000 tons of ore from the Franklin and Pochuck mines during the summer months, and with the Passaic Zinc Company to transport 25,000 tons of zinc ore. To facilitate this increase in heavy freight, the company ordered a new locomotive from a Paterson firm. The railroad company were also carting Spanish ore to Franklin, where it was mixed with local ores to produce a superior quality of Bessemer iron. The Franklin Iron Company also purchased a mineral tract in New York, along the Hudson River, and was to receive ore from these mines, as well as African ore, all of which was to be shipped from Hoboken over the D. L. & W. and Sussex Railroads. The Company received large shipments of coke from Connersville, Pennsylvania, using one-fourth coke with three-fourths anthracite. About 75 men were employed at the works. When the Sussex Railroad Company first ran a milk train over their line in 1858, the amount of milk received did not average over 50 cans a night. By May 1874, the milk train carried over 400 cans and was one of the most profitable businesses on the route. The freight charges on a can shipped to Waterloo was 20¢, bringing the total earnings of the train to $75 per trip. Almost all the milk carried was sold to the Newark Milk Company, though a few cans were forwarded to Hoboken. In January 1877, over one thousand cans of milk were being shipped weekly over the Sussex Railroad. A large trestle and chute was constructed at Waterloo in March 1879 for transferring ore from rail cars to Morris Canal boats. A spur leading from their main track to the ore dock and canal at Waterloo was completed in April 1879. At Waterloo, the Franklin ore was transferred from rail cars to canal boats for shipment to Newark. Scales for weighing ore cars were located at the Whitehall summit switch, below Andover. The Sussex Railroad Company commenced the erection of a new telegraph line between Waterloo and Franklin on July 3, 1879, and had the wire up as far as Monroe Corner after a weeks work. It was a single wire intended only for company use in running its trains. The Sussex Railroad and the Delaware, Lackawanna & Western Railroad employed operators at Waterloo, Newton and Franklin. The Sussex Railroad Company contracted with the Franklin Iron Company to transport 17,000 tons of ore from the Franklin and Pochuck mines during the summer months, and with the Passaic Zinc Company to transport 25,000 tons of zinc ore. To facilitate this increase in heavy freight, the company ordered a new locomotive from a Paterson firm. The railroad company was also carting Spanish ore to Franklin, where it was mixed with local ores to produce a superior quality of Bessemer iron. The Franklin Iron Company purchased a mineral tract in New York, along the Hudson River, and was to receive ore from these mines, as well as African ore, all of which was to be shipped from Hoboken over the D. L. & W. and Sussex Railroads. The Company received large shipments of coke from Connersville, Pennsylvania, using one-fourth coke with three-fourths anthracite. About 75 men were employed at the works. The Sussex Railroad disposed of two old engines and took delivery of a new engine, the E. F. Hatfield, Jr., from the Paterson shop in June 1879. Another new engine, named the Newton, arrived from the Paterson works in November 1879, complete with a patent spark arrester, and powerful enough to draw fifteen loaded cars up the Waterloo mountain. Two-thirds of the Spanish ore arriving at Hoboken was shipped to Franklin and, in late August 1879, the Sussex Railroad cleared the switches at Waterloo and Port Morris of the cars loaded with Spanish ore that had blockaded them for several weeks. The switches at Waterloo were extended to handle the additional traffic. The large furnace at Franklin was blown out on July 3, 1880, for re-lining and repairs, and there was no chance of work being resumed for several months. The company discharged all single men, but furnished employment for married men. After several weeks of negotiation, John I. Blair, president of the Sussex Railroad, sold control of the company to the Delaware, Lackawanna & Western Railroad on July 15, 1881. That portion of the railroad north of Hamburg Junction was sold to the Lehigh & Hudson Railroad Company. Talk of surveying a line between Andover and Stanhope was revived. John Kearn, the popular engineer on the Sussex Railroad, died on May 11, 1886. Born at Phillipsburg on September 15, 1841, he was hired in 1863 as night watchman at Waterloo. In 1865, he transferred to the Newton shops and soon graduated as one of the best engineers ever employed by the Company. In April 1887, a new combination car was placed on the Sussex Railroad. It was painted a dark olive green, like the parlor cars on the D. L. & W. Railroad. As milk cars were already painted the same color, it seemed that the old yellow had been traded for a new hue. Starting in January 1888, track hands on the Sussex Railroad found winter employment in widening and cutting down the grade through the Slate Cut between Newton and Andover. The curve was to be made into a straight line. In February 1888, Sussex Railroad trains were equipped with air brakes. On March 1, 1889, the D. L. & W. Railroad received a new locomotive, the Sussex, the largest on its line. Franklin Furnace shut down in 1890 because of competition from Lake Superior ores. The Sussex Railroad enclosed its new turntable, 55 feet in diameter, at Newton in December 1891. Thomas Clark died at his residence on Railroad Avenue, Newton, on December 17, 1897. He was born at Old Castle, County Meath, Ireland, in 1821. He and his brother William came to the United States in 1847. William found employment at a New York bakery while Tommy worked in a quarry at Anthonys Nose, near West Point. They subsequently moved to Newark. About 1853, when the construction of the old Sussex Railroad was first commenced, Tommy Clark, in company with his life-long friend Jimmy Daly, worked in the freight yard of the Delaware, Lackawanna & Western Railroad. They entered the employ of the Sussex Railroad, and upon its completion, the two were given positions at the Newton freight station. With the completion of the new passenger depot he was promoted to baggage master. He retired on a pension in 1896. He was twice married, his first wife being Maty Ann McLaughlin, who died in 1882. One child was born of this union, but died in infancy. His second wife was Joanna Howard, of Newark, who survived him. He was buried at the cemetery of the Holy Sepulchre in Newark. The Century Milk Company, of 901 Sixth Avenue, New York, operated an extensive creamery near Morristown. When it was insufficient to meet the demands of their increasing patronage, they sought ought a location for an additional plant in a locality that enjoyed a reputation for producing milk of the greatest purity and in sufficient quantity to accommodate their needs. The purity of the spring water and the general cleanly appearance of the farms for several miles around Newton attracted the attention of company representatives. They purchased a plot of ground of one and a half acres in July 1901, adjoining the railroad track at the east end of Trinity Street, and awarded the building contract to ODonnell & McManiman on July 16, 1901, for the erection of a creamery 91 x 55 feet. The new creamery was scheduled to begin operations by October 1. Only sterilized milk was to be shipped. At the annual meeting of the Lehigh & Hudson Railway Company in New York on December 10, 1888, there was no opposition to the regular ticket. The only significance of the election was in the changes: Messrs. Maxwell, Corbin, Baker, and Adams, being new members of the board. Joining with four incumbent directors representing the Lehigh Coal & Navigation Company (which was controlled by the New Jersey Central Railroad), they formed a majority. The purpose of the change in ownership and management was to establish a connection, via the Poughkeepsie Bridge, between the New Jersey Central, the Lehigh Coal & Navigation, the Philadelphia & Reading Companies, and the railroad systems of New England. A company called the Orange County Railroad was incorporated in the same interest to build a short line from Greycourt to Montgomery, which would join the Lehigh & Hudson with the Wallkill Valley Railroad, and thereby complete the connection to the bridge lines. The anthracite coal trade of New England was to be nearly revolutionized by the opening of this shorter route to the Pennsylvania coal fields. The farmers of the northern portion of Sussex County were much delighted over the new order of things, as this railroad would give them a direct communication with both New York City and Philadelphia, thereby giving them a market for their milk in both cities. The following officers were elected by the stockholders of the Lehigh & Hudson River Railway: Grinnell Burt, President; J. S. Harris, Vice President; D. B. Halsted, Secretary; John Sayer, Treasurer; and N. L. Furman, Superintendent. The Directors were: J. S. Harris, F. C. Yarnell, E. W. Clark, F. Lewis, G. Burt, J. S. Martin, W. C. Sheldon, G. W. Sanford, J. R. Maxwell, Austin Corbin, G. F. Baker, E. D. Adams, and G. A. Hobart. About 100 Italian laborers were set to work on the Pennsylvania, South & New England Railroad, near the Orange County Stock Farm, on December 10, 1888, Several hundred more were put to work between that point and Pine Island before the week ended. The company managers decided to take one of the old routes made some years previously in that section, keeping down on the low meadows, striking the gravel hills on the crossroads from Unionville to the Stock Farm, and crossing the old Deckertown and Goshen Turnpike close to a small house owned by Alexander Hawkins, near the Milton school house. They planned to cross the New York, Susquehanna & Western near the residence of John Thompson, in Deckertown, and not go under it as planned several years earlier. By so doing, the company abandoned quite a stretch of road which was built at that time. In deciding to seek an independent outlet by extending its line to Cornwall-on-the-Hudson in July 1901, the officials of the Lehigh & New England Railroad, running through northern Warren and Sussex Counties, and at first known as the South Mountain Railroad, carried out a project that had received long and careful consideration. Ever since the road was built, it was dependent for an outlet to tide water on other lines with which it connected, but with its expanding trade through the slate regions of Northampton County, Pennsylvania, the officials determined upon seeking an independent outlet. The Lehigh & New England Railroad, part of the old Poughkeepsie Bridge system, was purchased in January 1904 by the Lehigh Coal & Navigation Company, which owned large tracts of anthracite coal land in Pennsylvania. The property acquired began at Slatington, Pennsylvania, and extended to Pine Island, Hainesburg Junction and Swartswood Junction. 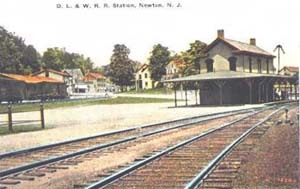 Newton business interests demanded better railroad facilities and a more direct and quicker communication with New York and other towns. The Sussex Register considered it undisputed that as a terminus Waterloo is inconvenient, and also expensive in time and labor. It was also felt that there are more cheerful places than Waterloo at night, and a closer connection would not harm anyone ... A survey for the proposed change in terminus from Waterloo to Stanhope, completed in April 1898, suggested departing the line near the Musconetcong bridge and running across the low land. It did not reduce the distance (only 1.5 miles) as much as the survey leaving the line near the white rock cut and running southeast down the mountain, but it was easier to build and consequently less costly. Construction work commenced on the cut off to Stanhope on July 5, 1900, with the felling of timber along the proposed right-of-way. The spur started at the foot of the mountain, near the switch leading to Allens quarry, instead of at Cranberry Lake, as first proposed. The Allen Granite and Construction Company began building a large granite bridge over the Musconetcong River, on the Wills property, to accommodate the new line of track. The arch of this railroad bridge was seventy-four feet long, fifteen feet wide and twenty feet high. To reach Stanhope, a thirty-foot cut into the Sugar Loaf was made and a draw-bridge erected across the Morris Canal. A large force of Italians was employed in grading, with completion of the line expected by winter. In September 1900, the contractors completed the stone work on the bridge arches, allowing construction cars to assist in grading the new spur. Contractor Thomas J. Allen commenced track laying on the new cut-off in April 1901, expecting to complete the job in five weeks. Piles were then driven for construction of the bridge over the Morris Canal. It was anticipated that making Stanhope the terminus of the Sussex Branch would increase passenger and freight traffic by shortening travel time to and from large metropolitan centers of trade, cutting the running time by a half hour for express trains via Newark and Morristown. The new Sussex tracks ran about where the old Netcong station was, but a new station was built between the existing tracks. The switch running beside the west-bound track at the station was lengthened to Waterloo for the exclusive use of east-bound passenger trains, while the existing loop line (as a portion of the east-bound track was called), was to be used entirely by freight and coal trains. The railroad company planned to lay two additional tracks through Stanhope to accomodate increased business at that point. Waterloo was left without telegraph facilities, since the operator in the tower at the end of the long switches was not allowed to send private despatches. Interestingly, as a footnote to history, Alanson A. Haines, one of the original surveyors of the Sussex Railroad, claimed in January 1906 that he had provided a route down Waterloo mountain directly to Stanhope and Lake Hopatcong, which would have saved the Sussex Railroad Company thousands of dollars over the former route to Waterloo. The completion of the Stanhope Cut-Off spurred the development of Cranberry Lake as a railroad summer resort. In June 1902, George King, of Ledgewood, moved his merry-go-round to cranberry lake, near the the pavilion then being erected on the pleasure grounds. James French paid $250 for the island and lakefront woodland in July 1902, leasing the premises to the Lackawanna Railroad for ten years at the annual rental of $4,000. 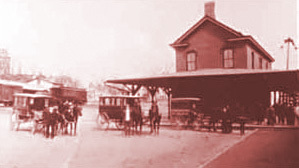 The venture proved such an immediate success that the railroad company issued orders in August 1902 for an extension of the depot platform, which was to be rebuilt three times its former size. It became the largest such accommodation on the M & E Division, capable of sheltering one thousand people. work commenced on a wye and turntable at the old stone quarry, allowing engines to be turned at the lake. The depot siding was extended at each end to hold eighteen passenger coaches. The Lackawanna erected an ice house for its own use at the upper end of Cranberry Lake in January 1903, relieving them of having to supply their resort with ice from the large ice storage houses at Waterloo. Edward Rosenkrans, the D. L. & W. agent at Andover for many years, resigned his position in August 1902. Louis Ratti completed renovations to his new dwelling and store opposite the Newton Depot on lower Spring Street in October 1903, installing plate-glass storefront windows. He transferred his business to the new location in November 1903. In May 1904, Charles Fredenburgh began blasting a cellar out of the rock for a new extension to the Lackawanna House, opposite the Newton Passenger Station. The new addition, measuring 20 by 30 feet, was attached at the rear of the pool room. Two pool rooms were placed there and a barber's shop installed in the former pool room. Fredenburgh sold the Lackawanna Hotel to Henry F. Durling in March 1909. The Newton creamery, handling 250 cans of milk daily, passed into the hands of the Dairy Products Company, of New York. The Century Milk Company originally built and operated the plant, being succeeded by the Thornsdale Farms Company in 1903. Concrete foundations were beginning to replace stone and mortar in 1904, and the D. L. & W. Railroad Company was reportedly using concrete in all of its new buildings. The bridge to the island at Cranberry Lake was rebuilt, wider and higher, in May 1903. The station platform was extended to 1,800 feet, outfitted with ample seating in the covered portion. Twelve rustic summer cottages were also constructed. The new hotel at Cranberry Lake was named the Panther Hills Inn in July 1904. In consequence of the Stanhope Cut off, the Lackawanna expended nearly $100,000 to upgrade its Newton facilities. On April 16, 1905, work began on a new turntable, the fifth such device installed in the Newton yards since 1854. demolition of the old roundhouse at Newton began in July 1905. painters also began decorating the interior of the Newton Station, which had been converted to one large room. Tickets were now sold through one large window instead of the two cubby-holes located respectively in the rooms formerly divided by doors and a stairway. a marble drinking fountain was also installed. On March 24, 1906, the new heating plant at the Newton Depot was tested and a new roundhouse occupied for the first time. In May 1906, workmen began tearing down the old wooden railroad Depot built in 1855. The old railroad water reservoir on Halstead Heights, above the Freight Depot, was filled with cinders in July 1906. Work also began on a railroad culvert to eliminate the Drakes Pond crossing. A model Freight House  the first ever built of concrete rather than brick along the line of the D. L. & W.  was ready for occupancy on January 21, 1907. Designed by architect F. J. Neis, under the supervision of Chief Engineer Lincoln Bush, the building measured 133 by 32 feet with office and record rooms on the street end. The length of the Sussex Railroad was about 35 miles and the cost of construction about $2,000,000. (The Freight Depot still stands opposite the National Hotel on lower Spring Street) In May 1907, work resumed on the concrete retaining wall, which was to be topped with an ornamental iron fence. Sparta Avenue was widened three to eight feet in June 1909 and the concrete wall built along the railroad yard. The newspapers sarcastically reported on improvements to the Monroe station in August 1906, noting that the supports had been sawed off, allowing the box to rest on the ground. 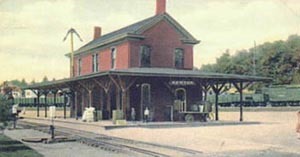 A connection to the Lehigh & Hudson was made at Andover Junction in 1905. Changing the transfer point for freight to the Lehigh & Hudson Railroad from Franklin Junction to Andover Junction in 1905 also curtailed the amount of business on this section. As late as 1915, several trains each day were needed to carry zinc ore and limestone from the Windsor Lime Company and the New Jersey Lime Company. But limestone quarries eventually closed and shipments of ore from the Zinc Companys mines at Franklin were greatly reduced. The Bordens Company acquired the Stevens creameries at Monroe and Ackersons Crossing in June 1917. Soon afterwards, William Provost, owner of the Monroe creamery on the Lackawanna track, considered changing to the lower Monroe creamery, located alongside the Lehigh & Hudson Railway, because of better train service, better facilities, and its proximity to Kimbles Pond, where ice could be cut. Charley Albert Chasseaud, of New York City, who successfully managed the Cranberry Lake Hotel and island the previous season, again leases the resort property in May 1906. On opening day, however, it was announced that Jacob J. Muller, formerly of the Half-way House, near Milford, and not Mr. Chasseaud, would manage the hotel property. There was considerable speculation in November 1906 that the Cranberry Lake's days as an excursion resort were numbered. Byram tax collector John D. Cowser sold sold the hotel property for non-payment of taxes to James French of Waterloo. with unobstructed possession of Bertrands Island and an entrance to Lake Hopatcong, the Lackawanna wasexpected to transfer its excursion business and not kowtow to Mr. French. George A. Williams consequently redeemed the tax lien and retained possession of the hotel; the lease had seventeen years to run. George A. Williams, William D. Ackerson, and William H. Earl filed articles of incorporation on June 8, 1906, forming the Cranberry Lake Amusement Corporation to erect hotels and cottages and to maintain picnic grounds. P. H. Conklin & Company put up two large coal bins near the Lehigh & Hudson station at Andover in December 1906 and moved their scales to the east side of the turnpike [Route 206]. James Daly died in Newark on April 11, 1908. He had been born in County Tyrone, Ireland, on November 3, 1823. He was employed in the construction of the Sussex railroad and came to Newton in 1854. He was the first man employed in the Freight depot, where he remained until being transferred to Newark in 1874. william Hunt, station agent at Warbasse Junction, where the railroad branched to Franklin and to Branchville, retired in December 1908, after 42 years of service. although nearly deaf, he reportedly had the peculiar faculty of distinguishing messages sent over the wires. C. H. Hall, agent for several years at Andover, was relieved of heavy work in January 1909 and Virgil Crisman installed. A newspaper correspondent described the condition of the railroad station at Andover on Tuesday morning, October 19, 1909, noting that it "would have been a disgrace to the original Mule railroad running here sixty years ago, and would not have been tolerated at that time. The waiting room I think is 14 x 16 feet, and contained at this time the following: first, on the floor, was nearly a quarter inch of dirt and gravel carried in from the gravel platform outside; near the center a large sack of leather; in one corner a scissor grinder with his machine, plying his trade; in another corner, a pile of what looked like Italian baggage, consisting of bedding, etc., hemmed up and held together by a huge bag of poultry food or fertilizer, which, by the by, have been there for weeks; a stretcher setting up under the ticket desk, giving a gruesome feeling to the waiting passengers; in another corner, a water tank. Sandwiched in were two ladies of prominent families and two or three men, waiting for the train. The absence of any Italians at the time made it possible for the other passengers to breathe. At 10 oclock, same conditions prevailing minus the scissor grinder, but adding eight ladies and three or four men, waiting for the train. If there is a worse conditioned station, either passenger or freight, in the State of New Jersey, I certainly pity the patrons. If there is one place before another which calls for the scrutiny of the Railroad Commission, it is ours; and we should call them at once. Dont think this report is overdrawn, for I tell you the conditions are worse than described." Constant public complaints spelled out a need to improve railroad accommodations at Warbasses Junction. The station at that place consisted of an old abandoned freight car dropped at the side of the track. By all accounts, it could not accommodate half a dozen persons and it was barely possible for a person to stand upright within its doors. For years the people in the neighborhood, and the traveling public, who transferred at this point for the D. L. & W. Raiload frequently complained. It was not only the station accommodations that caused the complaints heard from patrons of both the Susquehanna and Lackawanna railroads. The two stations were he stations were 1,400 feet apart, and there were no facilities for a passenger traveling with a trunk, to have it transferred from one station to another. In March 1909, a lady visiting near Fredon, desiring to go to Sparta, had to be taken to the Stillwater station, instead of coming to Newton, as her trunk could not be transferred at Warbasses to the Susquehanna. Another complaint was the connection of trains at Warbasses between the two roads. It was suggested that the Susquehanna station should have been moved to the point where the two railroads crossed, with an L platform along the tracks. The trains on both roads stopped at this point, and the erection of a station at that point would have resulted in no loss of time to trains. The New Jersey Railroad Commission arranged for a hearing in reference to station accommodations at Warbasses on August 16 in the Sussex County Court House. The matter of better train connections with the Lackawanna at this point was also considered. Samuel Warbasse was the first witness and he testified that the only station was an old box car that had seen service as a depot for 15 years. One half was used for the passengers and the other half for the storage of freight. 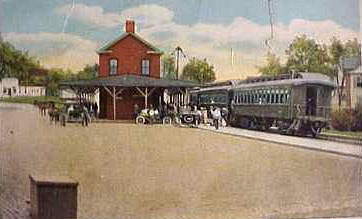 The Lehigh & Hudson Railway Company built new stations at Andover Junction, Tranquillity and Great Meadows in August 1909. In May 1911, George O. Young, of Andover, had contractors, including a dozen teams, scrapers and helpers, excavating a new cellar for his large feed house, which he planned to move several hundred yards and across the tracks on rollers from its original location just below the Andover railroad station. By early June, the feed house was in transit, as Young met with the D. L. & W. superintendent, his assistant, and the superintendent of milk traffic. In July, Young moved his house out to and facing another street. 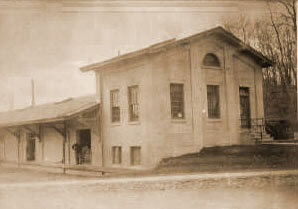 The feed house was moved across the tracks at night and set on its new foundation in early August 1911. The next month, George Young built an addition, 10 by 60 feet, to his relocated feed house. With the closing out of the Cranberry Lake Amusement Company in July 1911, wagons loaded with old boats, tables, chairs, and other debris were seen passing down the old turnpike. The railroad faced a new competitor as the automobile made its appearance in the first decade of the Twentieth Century and grew steadily in popularity. As early as 1906, the automobile craze was hurting the railroad's business. 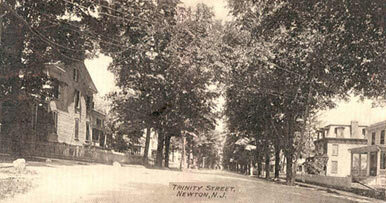 By 1911, there were 80 automobiles in Newton and the number was growing all the time. On August 28, 1910, 132 automobiles were counted within twelve hours passing the Hotel Newton. Service garages and auto dealerships sprouted to accommodate the new-fangled, self-propelled conveyance. a mile of experimental concrete road was laid at New Village, warren County, in November 1912. With the spread of paved roads, the automobile achieved dominance over the railroad between 1920 and 1940. Agent Frank Gibbs, who was long employed on the Sussex Railroad at Branchville Junction, accepted employment on the Lehigh & Hudson at Andover Junction. In the fall of 1912, he disposed of his place above the Junction, which included White's Lake along the highway, and purchased a lot on Andover Junction, adjoining the wye connection, where he built a brick cottage in the summer of 1913. Owing to the scarcity of men, brought about by war conditions, Miss Ethel Wilson, of Newton, was employed in the freight office of the Sussex Railroad in January 1918, becoming the first woman to fill such a position. With a reduction in limestone and zinc shipments from Franklin, the growing use of trucks to ship freight, and the loss of passenger ridership to buses, business on the nine-mile section between Branchville Junction and Franklin dwindled away to nothing. The 5:36 P. M. train from Franklin to Newton was dropped from the timetable on April 24, 1921, adversely affecting quite a number of hourly men employed by the Zinc Company. Loss of this train also inconvenienced riders from the borough of Sussex who wished to travel to Newton as it became necessary to leave Sussex at noon and go by way of the Lehigh & New England through Augusta. The Fairfield Dairy Company, of Montclair, purchased the Provost Creamery at Monroe in May 1926. The Sisco Dairy Company, which operated a creamery at Woodruffs Gap, purchased a large piece of land from Lewis Price at Ackersons Crossing, intending to build a large new creamery and ice pond. In the early hours of July 5, 1929, fire destroyed the former William Provost creamery at Monroe, owned by C. M. Anderson but closed for two years. The Lackawanna waiting room and freight station were also lost to the flames. Lewis R. Wickham lost the lumber for a ready-to-build house, stored in the creamery, which he planned to erect at North Church Village. After forty years operation, Darling Old Nell, the morning (6:55 A. M.) Lackawanna train between Franklin and Newton ended service on February 2, 1931. As this train carried mail from and to Newton, Postmaster Walters arranged for bids for carrying the mail to Newton twice daily, the recompense to be $800 annually. It also carried freight and passengers. The end of the morning train service on this line was taken as an indication of the vast change that has come over the American life during the past ten years, due to the widespread use of the automobile. Old Nell, the famous Franklin-Newton flyer, slowly died of starvation, as her patrons kept fading away, dwindling fast in recent years, until the last sad blow was struck on April 1, 1931, when the two faithful passengers, Jake Rodimer and Bob Adams, decided to desert the ship and henceforth ride the bus. Her career ended after forty years when she was taken out of service on May 1, 1931. The railroad applied for permission to take off the one remaining train on the it branch to Franklin, noting that the forty or fifty passengers who rode the afternoon train each week day had dwindled to about three a week in only eight years, due to automotive traffic. The milk business had evaporated; the limestone tonnage disappeared. In response, an agent of the Public Utilities Commission came to Franklin in August 1931 to check up on traffic, presaging a complete cessation of train service on the Franklin branch of the Lackawanna. When the Hamburg paper mill closed in 1933, freight transfers from the New York, Susquehanna & Western diminished. Automotive transportation of farm products stole business and passenger service was discontinued due to the fact that a majority of the passengers preferred to use buses, reducing the number of railroad passengers to one or two per day. Stockholders of the Sussex Railroad Company, a subsidiary of the D. L. & W. Railroad Company voted in February 1934 to abandon its nine miles of track between Branchville Junction and Franklin branch as a matter of economy.